Inquiring minds want to know, immediately and without any egghead qualifications: Does King Tut’s tomb have hidden rooms or does it not have hidden rooms? Answer? Well, it depends who you ask…. That’s unsatisfying isn’t it? If real life were directed by Spielberg, there would be no question: of course there are hidden rooms, and they’re filled with ingenious, deadly booby traps and priceless magical objects. CNN reports a “90% chance of hidden chambers,” perhaps containing the remains of Queen Nefertiti. But archaeologist and former reality TV star Zahi Hawass---Egypt’s own Indiana Jones, as he’s been called---doubts it, as do several other archaeological experts. Bummer. If you need some Tomb-Raider-style drama, however, you could do worse than to read the original accounts of Howard Carter (above, with anonymous worker), the English Egyptologist who originally opened Tut’s tomb in 1922 after five years of fruitless searching. Pair this narrative with the photographs you see here of the treasure horde Carter and his aristocratic benefactors stole, er, discovered in the tomb, and you’ve got yourself one heck of a real-life-adventure. 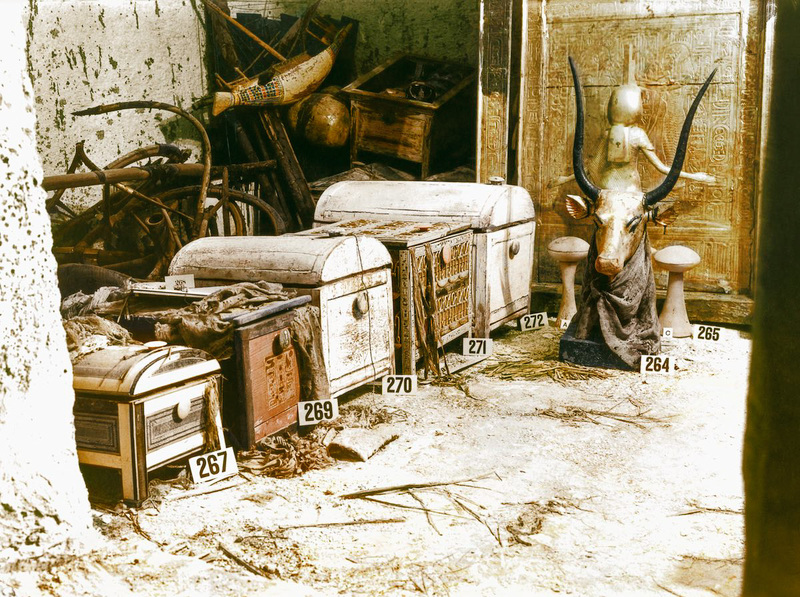 Taken between 1923-25, the photos document many of the 5,298 items that needed to be “recorded, sketched, and in some cases documented photographically,” the short video below tells us, the first in a 15-part mini video series created for a huge New York exhibition, The Discovery of King Tut, which just closed on May 15th. You may have missed the big show---with its life-sized recreations of the tomb's chambers--- but you can still experience much of the grandeur at its website. And Mashable brings us these photographs, colorized for the event by a company called Dynamichrome. The photos were taken by Metropolitan Museum of Art photographer Harry Burton (aka The Pharaoh's Photogarpher), the exhibition website informs us ("Only in Burton's photographs did the young pharaoh achieve true immortality"! 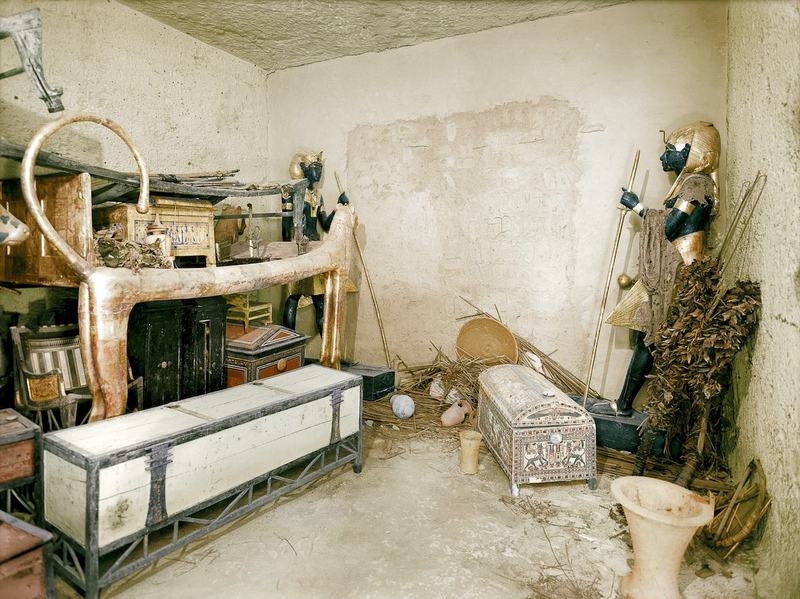 ), and the story of their creation is integral to the opulent tomb's excavation. Acting as "Carter's eyes and memory," Burton "trekked between the discovery site, his laboratory (which he had set up in the tomb of King Seti II) and improvised darkroom in the neighboring tomb KV 55." The results of Burton’s labors are 2,800 large-format glass negatives, which document all of the finds, their location in the tomb and every single step of the excavators’ work with the utmost precision. Carter patiently and unconditionally encouraged him like no other member of his team and, thanks to his photos, Burton was the first and only archaeological photographer to achieve worldwide fame. 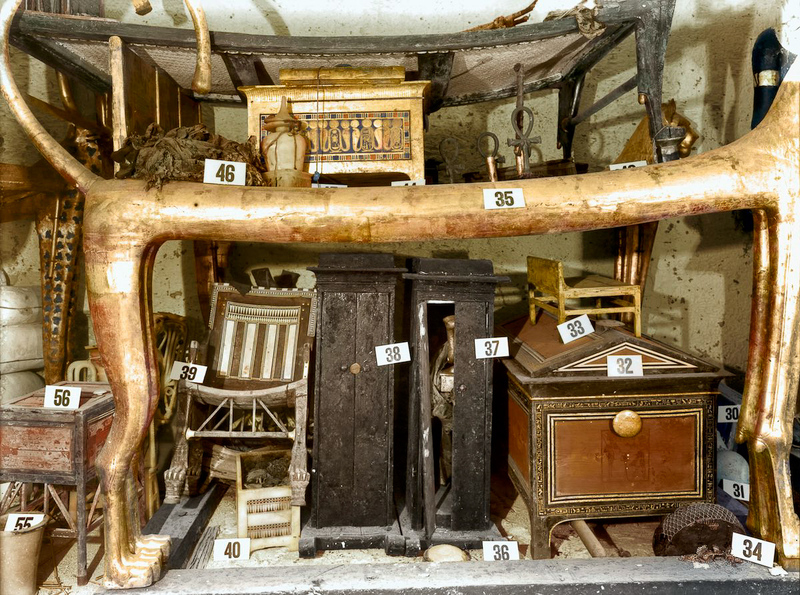 The entire process of removing the ancient treasures from Tut's tomb took ten years, partly due to the difficulty of preserving organic artifacts like textiles, fragile wood furniture, and footwear. Thankfully for us museumgoers and lovers of ancient history, the tomb's discoverers treated the artifacts with great care. This has not always been the case. Throughout the nineteenth and twentieth centuries, actual tomb raiders, whose motives were less noble, took whatever they could find from ancient burial sites in order to make a quick sale, without regard for the careful cataloguing and conservation efforts Carter and his team observed. Theft and trafficking of artifacts is still rampant today. In an interview with U.S. News & World Report, Hawass describes not only how the ravages of time and neglect have damaged some of Egypt's precious history---including Tut's burial mask---but also how "nearly two thirds of Egyptian antiquities were smuggled abroad in 2011, 2012, and 2013." Such trafficking, he says, "is ongoing, but to a lesser degree." Much of it was the result of "museum-looting" during the revolution. 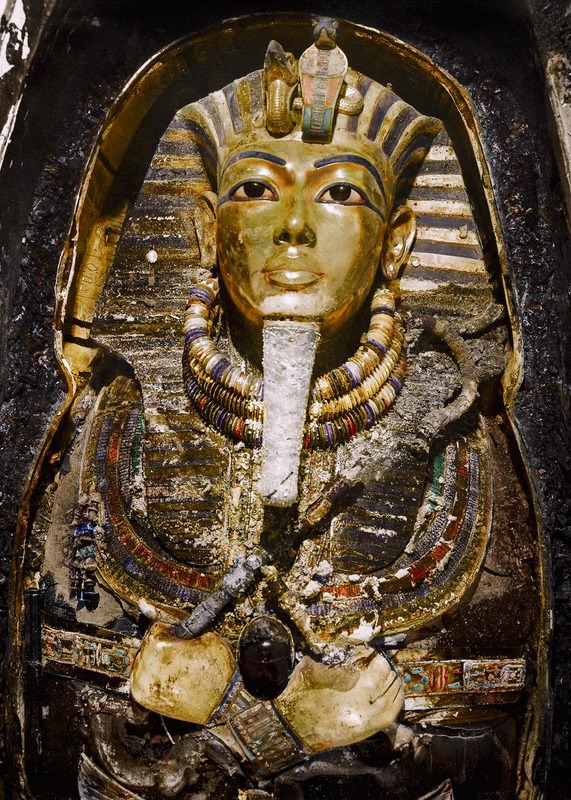 Hawass also disputes the hidden chambers theory, contending that "Nefertiti could not have been buried in the Valley of the Kings, as she used to worship King Tut. The High Priests of Amun would not have allowed it." Unfortunately, says Hawass, the only way to know for sure is to "dig through the northern wall" of the tomb, causing it to collapse. 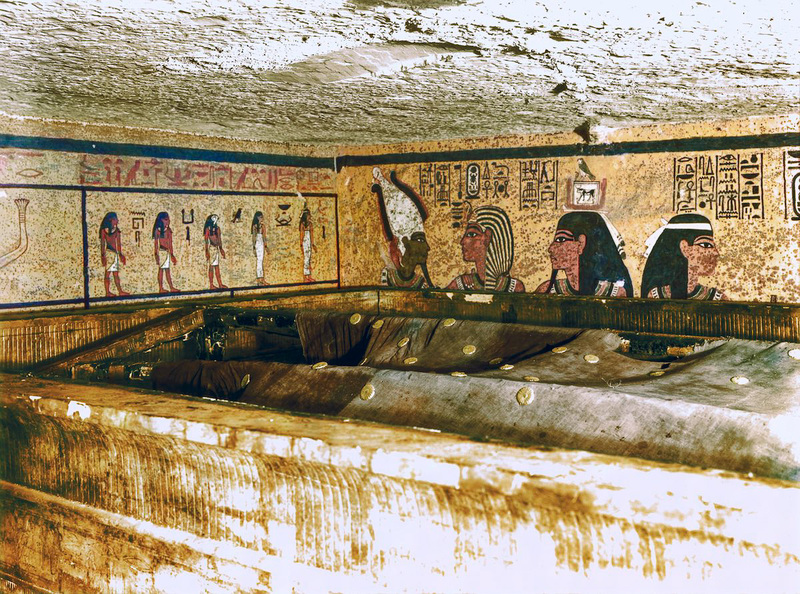 But we should not give up hope yet of Tut's tomb yielding more secrets. Archaeologist Nicholas Reeves, who published a paper in 2015 on the existence of hidden chambers, has further validated his conclusions with scans that suggest metal and organic materials beyond the tomb's north wall. Maybe Hawass is wrong, and we'll soon be posting pictures of the treasures gathered from Nefertiti's tomb. 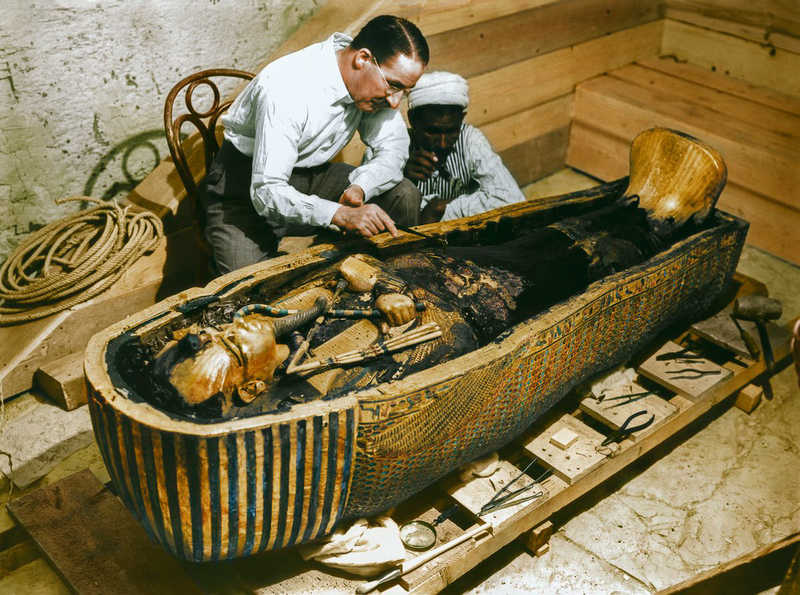 See many more of the colorized Tut photos at Mashable. Mesmerizing. Snapshots from 1323 BC. I could frame some of those on my wall (with the number tags shopped out).